The stock market became more overbought on Wednesday. S&P 500 increased 0.22%, Nasdaq increased 0.15%, and Russell 2000 increased 0.66%. Even with this rally, the VIX increased 2.37%. This increase in the VIX is probably meaningless. Even with the VIX’s increase, the CNN fear and greed index increased to 38 from 31. It’s still in the fear category, but it is at the highest level since the correction started in October. I think the action this year is overdone to the upside. There has been no economic reports which show the economy has rebounded. There also hasn't been many economic reports at all because of the government shutdown which has now lasted 27 days. Stocks are rallying after earnings even though guidance is weak, and analysts are lowering their estimates. The stock market was lifted higher by the financials because of Goldman Sachs and Bank of America. Financials and real estate were the best sectors as they increased 2.2% and 0.55%. Worst 2 sectors were consumer staples and communication services which fell 0.54% and 0.41%. Goldman Sachs stock was up 9.52% on Wednesday which was its best performance in 10 years. Specifically, Goldman last rallied this much in December 2008. It’s amazing how a mini bear market at the end of 2018 which was caused by a slowdown has caused such a record to be hit. The financial system isn’t close to being as unstable as it was in late 2008. Goldman’s stock is now up 14.56% year to date. Goldman reported $6.06 in EPS in Q4 2018 which beat estimates for $4.45. Excluding the help of the tax cut, EPS was $4.83 which still beat estimates significantly. Revenues also beat estimates as they came in at $8.08 billion which was above the $7.55 billion consensus. Investment banking revenues were $2.04 billion which beat estimates for $1.88 billion. This division was helped by a 56% increase in advisory revenue to $1.2 billion. This was catalyzed by the increase in M&A activity in the quarter. Best division was investing and lending which had revenues of $1.91 billion which beat estimates for $1.35 billion. Worst division was trading which had revenues of $2.43 billion which missed estimates for $2.58 billion. Fixed income trading revenues had an 18% decline. Goldman’s stock fell 34% last year. The rally this year is correcting that move which went too far. Bank of America’s EPS was 73 cents which beat estimates for 63 cents. The bank’s profits tripled to a record $7.3 billion. Revenues were $22.7 billion which beat estimates for $22.397 billion. Because of this great report, Bank of America’s stock rallied 7.16%. The firm bought back $26 billion worth of stock. The consumer banking division had a 52% increase in revenue to $3.3 billion. Loans were up 1.9%, and credit and debit card spending were up 6%. The economy didn’t shut down at the end of last year even though that’s what the 14% decline in in the S&P 500 in Q4 made it seem like. Now growth is continuing to slow, but stocks are still correcting for the decline that went too far last year. The bank’s net interest income was 2.48% in Q4 which was above estimates for 2.45%. Fed won’t be raising rates in 2019 and probably for the rest of the cycle, so net interest income probably won’t improve much more. Like the other banks, fixed income trading revenue was down. It fell 15% to $1.45 billion. This missed estimates for $1.62 billion. The good news is equities trading revenue was up 11% to $1.1 billion. With the lack of economic reports because of the government shutdown, it’s even more important to review earnings. Specifically, the all important retail sales report from the holiday season didn’t come out because of the shutdown. Business inventories report also didn’t come out. President Trump signed into law that the 800,000 government workers who are effected by the shutdown will get back pay after the shutdown. This isn’t a surprise as I always stated this would happen. I hope this new legislation doesn’t inspire lawmakers to think the shutdown is now ok.
Key deadline is Friday the 25th because that’s when workers would be scheduled to get paid again. Only 36 firms had reported earnings as of 8:30 AM on January 16th. Next week is when the influx of earnings reports starts. These results are still pivotal because usually how earnings season starts is close to where it ends up. As you can see from the table below, only 53% of firms beat sales estimates. The average sales beat rate is only 0.18%. If you add in the two reports from CSX and Kinder Morgan after the close, the beat rate is still 53% and sales growth is still 7.6%. With 38 firms reporting, the EPS growth rate was 23.1% with 82% of firms beating estimates. The Empire Fed report is the first regional Fed manufacturing survey from January. It was a disaster as the general business conditions index fell from 11.5 to 3.9. As you can see from the chart below, when the survey’s components are used as a proxy for the ISM PMI it produces a PMI of 51.9. This weighting’s reading is the lowest since January 2017. One reason for this weakness is because the new orders index fell 9.9 points to 3.5. The shipments index fell 2.4 points to 17.9. 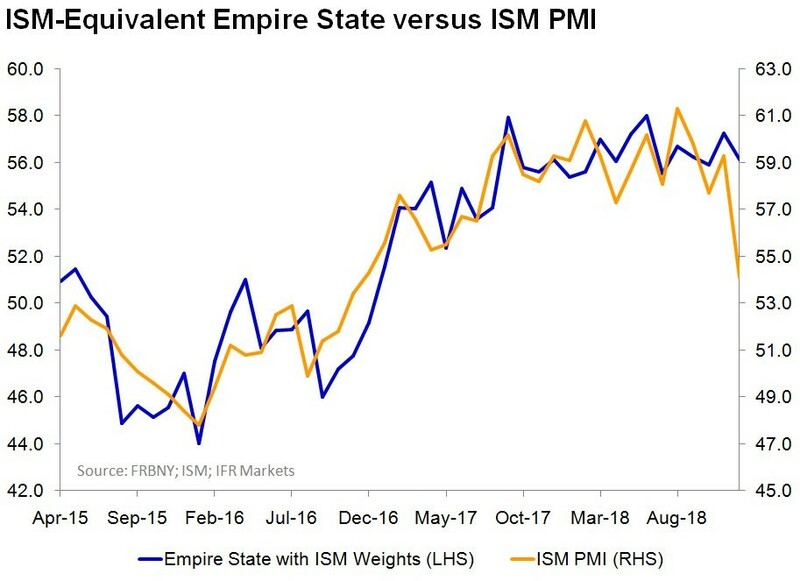 The ISM like weighting using the future Empire Fed components provides a PMI reading of 55.5. This weighting’s reading is the lowest since November 2016. This weighting was probably weak because the 6 month general conditions index fell 12.8 points to 17.8. New orders and shipments readings fell 15.3 points and 11.4 points to 19.5 and 22.4. Capex and technology indexes were also weak as they fell 13.3 points and 6.1 points to 17.9 and 20. Good report. Easy to understand, Thanks to all.